Expect to be here for an hour and half to two hours for an initial visit. Follow up appointments are one hour. You will have time to talk with your practitioner and go over any questions or concerns you have, as well as any changes that have occurred since the last visit. You will then receive a treatment (on a massage table generally) using the insertion of fine sterile needles that are left in for 20-30 minutes and can be removed and reinserted if needed. 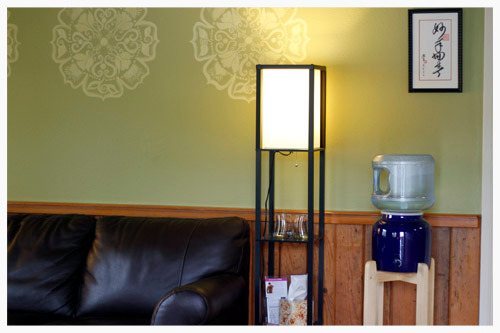 You will get to rest and recoup with the needles in a warm and relaxing environment with music if you like. After your treatment, you may feel energized or may experience a deep sense of relaxation and well-being. Come with any questions you have --- we're here to help you. Eat something small before you come in. Refrain from overexertion, working out, drugs, or alcohol for up to 6 hours after the visit. Between visits, take note of any changes that may have occurred, such as the alleviation or pain, pain moving to other areas, or changes in the frequency and type of problems.